Railpictures.ca - Dave Beach Photo: The power for a unit train down to Port Maitland sits on the ready track at the Chatham Street roundhouse on the morning of February 28, 1982. We’d be a little disappointed that they spoiled the solid lash-up with a trailing CP MLW but a bigger disappointment was that the clera skies didn’t hold up long enough. | Railpictures.ca – Canadian Railway Photography – photographie ferroviaire Canadienne. 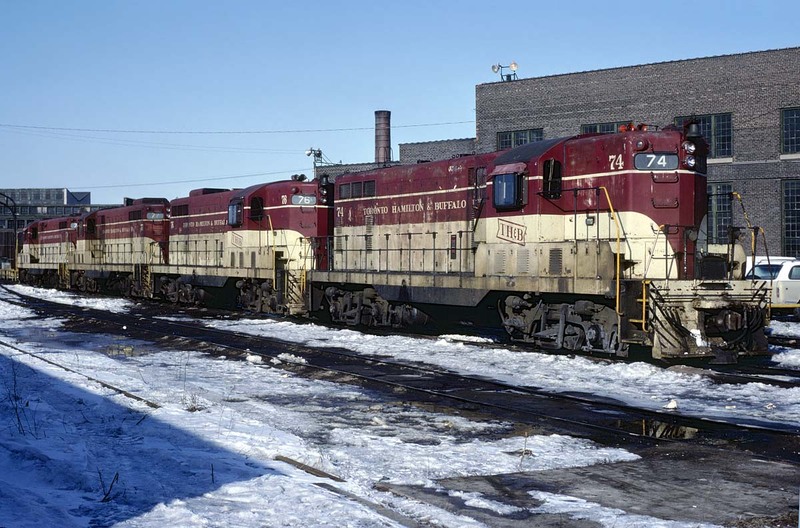 Caption: The power for a unit train down to Port Maitland sits on the ready track at the Chatham Street roundhouse on the morning of February 28, 1982. We'd be a little disappointed that they spoiled the solid lash-up with a trailing CP MLW but a bigger disappointment was that the clera skies didn't hold up long enough. Steve, not sure that we were thinking ahead to the railroad being completely absorbed but we knew that the image was going to change with an increased amount of CP red. So made quite an effort to pull this day off. I had taken a couple of weeks off to railfan before starting a new job and was down in the southern US when the weather turned bad. We came home a day early and somehow coordinated to meet up in the early morning with a few other guys who knew this train would run on a Sunday. I don’t know how we managed that being on the road before cell phones. Curious, in 1982, did you guys have an inkling the TH&B might be swallowed whole by CP? After all they did now own a Majority interest at the time. Great image and thank you for sharing.